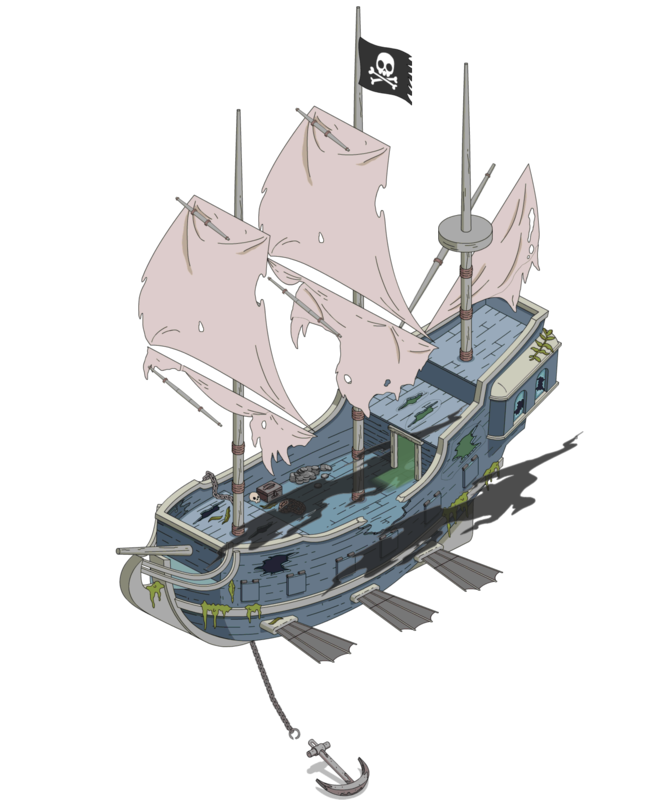 The final act brings us pirates, and Blackbeard is one of the most famous, and he’s now in our game. Join us right after the jump for his premium walkthrough! Blackbeard: ARRRR! I be Blackbeard, scourge of the Seven Seas! Gaze upon me and tremble, ye landlubbers! 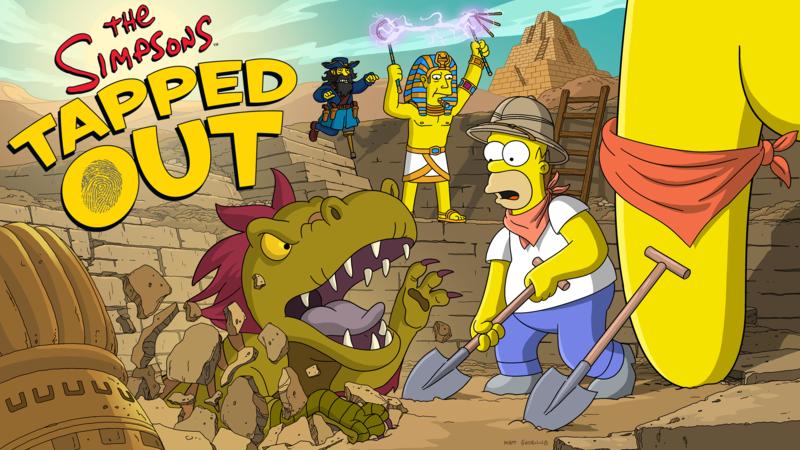 Milhouse: Cool! A fun pirate! Blackbeard: Fun?! Yer not scared of the vile murderer Edward Teach? Milhouse: Not at all! Pirates are awesome, even if some people say they’re for babies. Milhouse: It’s not like you’re the GHOST of Blackbeard or anything. Wait, are you? Blackbeard: Uh… sure thing. If that’s what scares ye, that’s what I be. Boo! Blackbeard: Me treasure is dug up! How was I to know that Miami Beach would prove a less-than-ideal hiding spot? Blackbeard: I’m penniless, ship-less, no one’s afraid of me, and I don’t even have a crew. 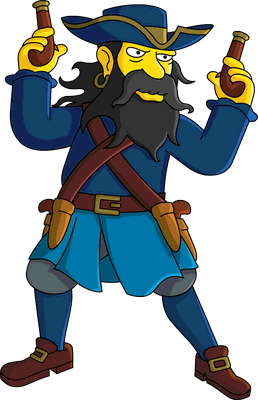 Bart: Maybe I can join his vile pirate crew! Can I, Ma? Can I? Marge: That sounds so cute! Let me get a picture of you with the funny “pirate”. Blackbeard: Look, lady. I murder people. All the time. Over a few gold pieces. I’m not proud of it, but there you go. Marge: Ooh! Him a SCARY pirate, isn’t him? Blackbeard: If all the lads here are like this “Bart” fellow, it’s going to be one pathetic crew. Blackbeard: He made me promise him chocolate milk at every meal and one hour a day of something called “screen time”. Blackbeard: Without me terrifying reputation, I’m nothing! But how can I make people fear me without a ship or crew? Herman: The right firearm might bring your swagger back, my friend. Blackbeard: Arr! You be missing a limb! I like that. Three really is the ideal number of appendages for a fellow. Blackbeard: Good God! I be one of history’s bloodiest pirates, and even I be horrified by the cannons these people carry around. Blackbeard: What kind of lunatic needs a semi-automatic rifle? No wonder these trigger-happy madmen aren’t scared of ol’ Blackbeard! Blackbeard: No one here understands me. I be obsolete. A dinosaurrrrrrrr. Sea Captain: I like the cut of your “arrrrrrrrrrrs”, stranger. Blackbeard: Do me ears deceive me? Be you a fellow pirate? Sea Captain: No. But for some reason, I talk like one. Point is, matey, you arrrrrre not alone. Blackbeard: Take me to sea, or lose me forever! Sea Captain: Step right this way. Me ship awaits! Next Happy 4th of July! Last day of the Time Traveling Toaster event and of the 4th of July 2017 update are here!